Attached to a small yet significant piece of parchment in the Archives [SGC XI.G.1] can be found one of the earliest examples of a medieval lady’s seal to survive anywhere in the country. 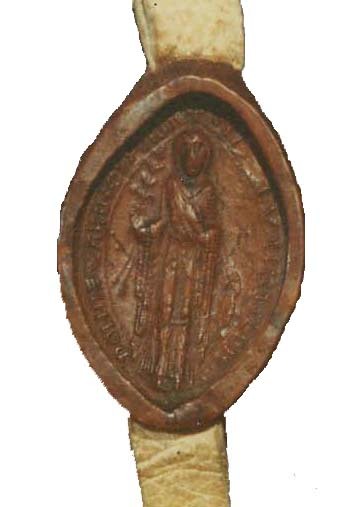 Dating from c.1122-1133, the seal belonged to Matilda of Wallingford and shows her standing in full length robes. In her hand Matilda holds a lily: the supreme symbol of the Virgin Mary and the most commonly found device depicted on noblewomen’s seals in this period. The charter validated by Matilda’s seal states that she has given Great and Little Ogbourne to the Abbey of Bec in Normandy. In doing so she hoped for the salvation of her soul and those of her ancestors. By this gift Matilda also began a chain of events that would eventually lead, via the Hundred Years’ War and John, Duke of Bedford, to the spiritualities of Great and Little Ogbourne coming into the possession of St George’s Chapel.